Los Angeles Dodgers' South Korean pitcher Ryu Hyun-jin has been confirmed as the team's fifth starter to begin the new season. Manager Dave Roberts said in Glendale, Arizona, site of the Dodgers' spring training, on Sunday (local time) that Ryu will follow starters Clayton Kershaw, Alex Wood, Kenta Maeda and Rich Hill during the first week of the season. Kershaw will be the Opening Day starter against the San Francisco Giants in Los Angeles on March 29. The Dodgers will start the season with four games against the Giants. 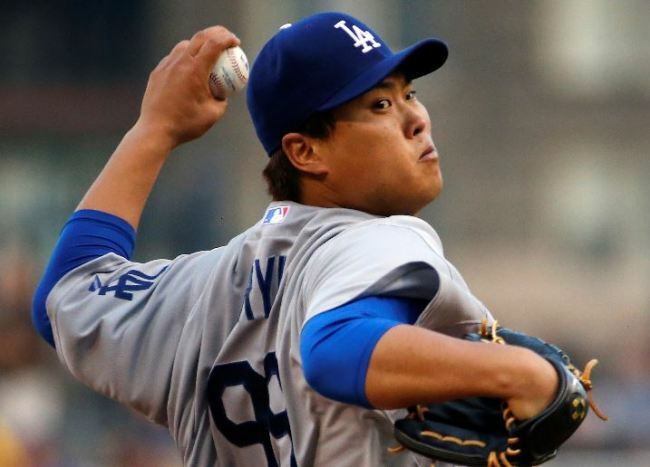 Ryu's first start will come against the Arizona Diamondbacks on the road on April 2. Ryu has a 14.29 ERA after two spring training starts. Most recently, he was charged with five runs on seven hits in three innings against the Chicago White Sox on Saturday, but Roberts said after that game that he wasn't worried. "I thought Ryu was considerably better than the line," Roberts told MLB.com. "I thought there were some pitches he was squeezed. I thought he threw the ball well. Velocity was good. The change, cutter, slider continues to improve. Where he's at this year in spring training, where he was at the last couple of years, considerably ahead of it. A lot of good things today." Ryu himself said he felt his command was better than it had been in his first outing against the Colorado Rockies on March 11, when he allowed four runs in 2 2/3 innings. The pitcher has been tinkering with his pitches this spring, trying to add a two-seam fastball to his repertoire and increasing the spin rate of his curveball. "There were a few unfortunate plays, and the curveball I've been talking about this spring (with a tighter spin), I tried to incorporate it more in today's game than I would have during the season," Ryu told MLB.com through an interpreter. "During that process, they were able to make pretty good contact. It's a work in progress." This will be Ryu's second full season back from a shoulder surgery that wiped out his entire 2015 season. Ryu also made just one start in 2016 before getting shut down with elbow issues. In 2017, Ryu was 5-9 with a 3.77 ERA in 25 appearances. He wasn't on the Dodgers' postseason roster as they made it all the way to the World Series, where the Houston Astros beat them in seven games. Ryu said he has more confidence in his health than in recent years. "Last year I had some doubts in my mind, but this year it's a full go," Ryu said. "Last year, I didn't know how my body would react to certain situations, so I had some sort of doubt. But any pitcher that comes back from surgery or an injury would feel the same way I did last year."